The Valspar Applied Science and Technology, or VAST Center is a good reminder never to judge a book by its cover. 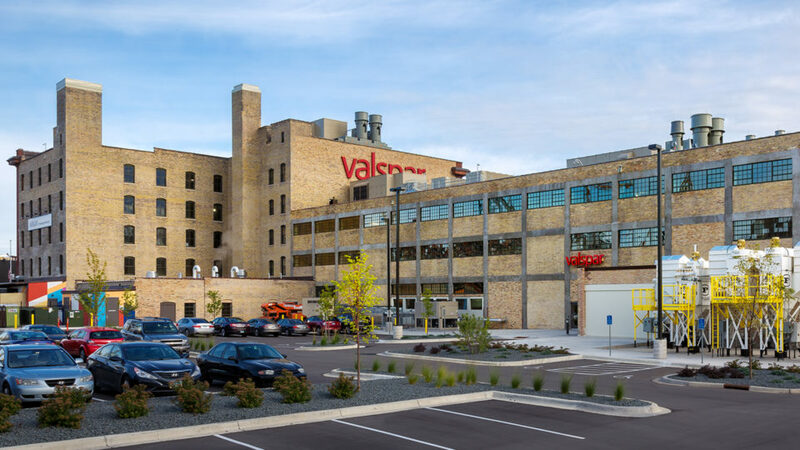 Located on the Valspar campus in east downtown Minneapolis, the building’s stately, century-old brick exterior and arched windows reflect the company’s history, even as researchers inside are shaping the future. 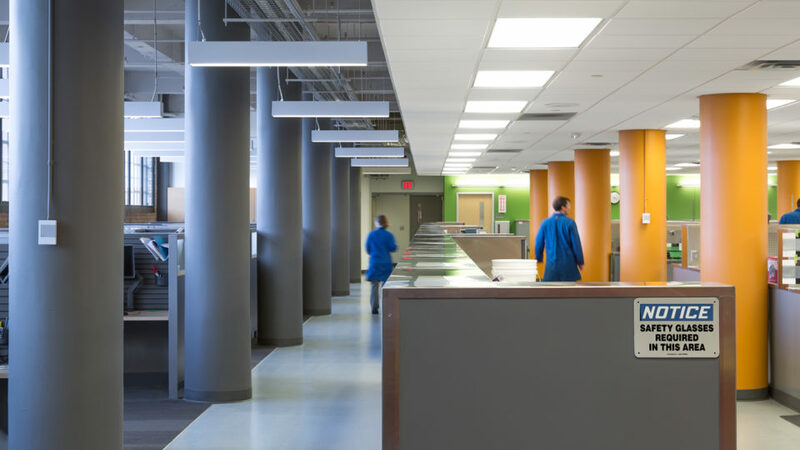 The VAST Center opened in 2014 after 13 months of construction that have transformed previously vacant space into world-class laboratories for Valspar, a global leader in the paint and coatings industry. At the same time, the project restored and preserves the structure’s historic architecture. The 170,640 s.f. project presented a number of design and construction challenges, starting with the building or rather buildings themselves. The structure is actually two buildings: a five-story timber framed structure, originally a paint manufacturing facility, built in 1903; and an adjacent, three-story concrete warehouse built in 1912. While structurally very sound, the buildings’ age and previous functions required thorough investigation and remediation to prepare for its new role. For example, the original, century-old building drawing records wouldn’t reflect the variations and settling that had taken place over the years. Instead, once gutted down to its original exterior and core walls and columns, the entire structure was scanned with a 3D laser scanner to create a highly accurate, 3D structural model for use in planning the MEP design, fabrication and installation. Scanning took six weeks to complete, far less time than the traditional process of taking field measurements, marking up drawings and turning these over to a CAD drafter to be drawn. The 3D laser approach greatly expedited the construction schedule, saving an estimated six months in the process, Harvey added. Valspar and the project team took a highly respectful approach to restoring the building, which is on the National Register of Historic Places. The project included restoration of original window frames, hardwood floors, brick surfaces and the five-story’s original entrance. Unique historic artifacts and discovered features are incorporated throughout the VAST Center, providing evocative reminders of the industrial past such as steel track doors and a resin tank that survives as a focal point in one of the conference rooms. Original timber support beams have been conserved throughout the five-story building. When some oversized timbers had to be removed to make way for ductwork, they were reclaimed and repurposed into millwork used in the showroom desk and throughout the building. At the same time, the building is served by extensive mechanical systems to provide sufficient ventilation and air exchanges throughout the building. Advanced fire protection systems are also employed throughout the facility, which maintains the stringent safety standards of a MNSHARP work site. The KA project team also supported the client’s safety values, successfully completing Minnesota OSHA’s Construction Health and Safety Excellence (CHASE) Level 3 program on the site with a full time safety director on site. The project accrued some 185,000 worker hours, all without a lost time accident. Earlier this year KA completed additional office finishes to house executive and support roles at VAST.